The White Garden at Sissinghurst provides inspiration for planting schemes using a sample palette. 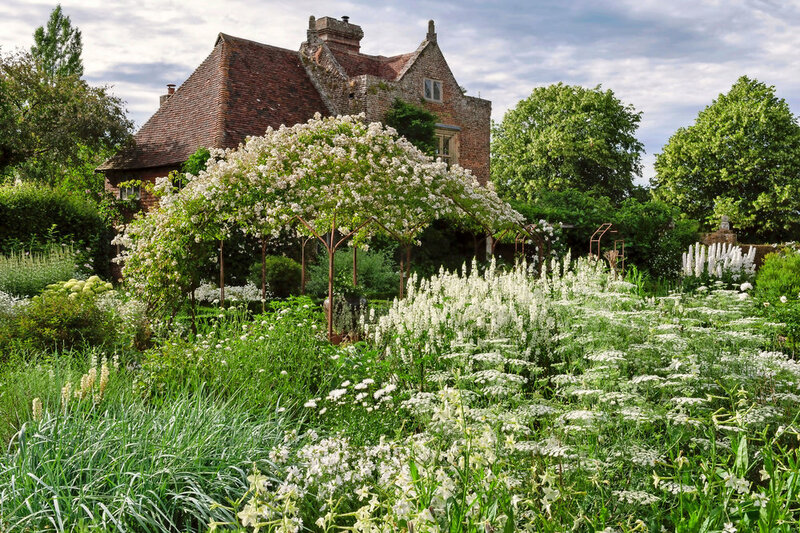 The White Garden at Sissinghurst Castle in Kent was first designed six decades ago by writer and poet Vita Sackville-West. A profusion of radiant white flowers amid silver, grey and green foliage creates a picture of ethereal romance on a summer’s day. Scent fills the air above borders frothing over with blooms. It is a breathtakingly beautiful sight. This is a garden of simple elegance, expressed through complex planting. It makes the most of the freshness and purity of white. “I visualise the white trumpets of dozens of Regale lilies, grown three years ago from seed, coming through the grey of southernwood, artemisia and cotton-lavender...,” wrote Vita. Her vision included silvery mats of Stachys lanata, white pansies, peonies and irises. All these plants continue to thrive today as part of a living, changing composition. Different textures and forms add distinction to the restricted colour scheme. Measuring just 40ft (12m) by 115ft (35m), the scale of the garden is modest. The majority of the plants at Sissinghurst sit well in gardens or borders surrounding less grand homes. An all-white planting scheme adds a touch of refinement to any border. There is no risk of one shade clashing with another. It has a singular intensity arising from the sheer concentration of one colour, but in many hues. “A great advantage of white is that there are so many different shades, but you have to keep the plants very fresh-looking. Faded white does not look good,” says Troy Scott Smith, Sissinghurst’s head gardener. This applies to a single border as much as it does at Sissinghurst. In fact, white is rarely totally pure, but a greatly toned down version of a specific colour. Apparently white blossom carries a pink tint, daffodils a creamy one. Sea hollies are blue in tone and nicotiana often carries hints of green. Herbaceous perennials are the mainstay of a limited colour garden or border, combined with scores of roses, climbers, shrubs and bulbs. Individual plants stand out from the crowd by virtue of contrasts between colour tone and form. At Sissinghurst, erect spires of lilies, delphiniums, foxgloves and Veronicastrum virginicum ‘Album’ contrast beautifully against the soft, rounded shapes of phlox, peonies and hydrangeas. Vita’s vision for the garden was of “a low sea of grey clumps of foliage, pierced here and there with tall white flowers”. In keeping with this, the White Garden features many plants that send up flower spires. Lustrous white delphiniums are one of her original choices, rising like altar candles. “Cutting back the main flower spikes once past their best encourages smaller, side shoots, prolonging flowering,” advises Troy. These are joined by white campanulas, foxgloves, mallows, rosebay willowherb and veronicastrum. The delicate creamy-white flowers of perennial herb meadowsweet fill the air with their strong, sweet smell. Within the overall picture, different plants play specific roles, in terms of structure or juxtaposition to others. There are those that create a white haze, subtly linking divergent plant forms and levels. These include Gillenia trifoliata with its masses of tiny, wayward flowers. At its feet, spreading plants such as violas, hardy geraniums and creeping forget-me-not cover the earth. These serve a double purpose, retaining moisture while stifling weeds. Spontaneity comes from self-seeders such as honesty and love-in-a mist. Vita achieved an almost effortless lavishness. “Always exaggerate rather than stint,” she wrote. A key factor when packing in plants in any border or garden is the careful gradation of heights. This starts from low-growing ground cover rising to border giants such as Crambe cordifolia, greater sea kale, which erupts into a cloud of tiny white flowers in summer. “After flowering, it can leave a hole, but the cut stems create a convenient cage to support climbing plants such as everlasting peas,” says Troy. Climbers are used to add height in borders, as well as clothe walls. One of the most prolific is Cobaea scandens ‘Alba’, the cup-and-saucer vine. A vigorous plant, it happily scales a wall with support and can grow up to 20ft (6m). It has exotic white flowers that look like a cup sitting on a saucer. The White Garden is contained on three sides by ancient brick walls, their mellow earthy tones weathered by lichen. There are many roses, in particular Rosa mulliganii. This is one of the largest tree climbing roses, here trained over a central arbour. “The original rose is about 40 years old and no longer drips in flowers. Roses dislike being in the same soil for too long, so we have added some new plants,” explains Troy. The brick walls are ideal for climbing and rambling roses, such as ‘Madame Alfred Carrière’. ‘Princesse de Nassau’ is trained over the corner pergola. Its semi-double white flowers appear from August. All would be at home in any white border, as long as they are kept pruned and within the space allotted to them. Foliage plants are a vital ingredient to a single colour garden or border. Foliage acts as both a foil to flower colour and a calming backdrop that unifies different elements. It reinforces the tonal variations, adding structure amidst effervescence. To complement shades of white, gardeners can choose from foliage that varies from a myriad of greens to greys, such as pewter, leaden or steely. In between are silvers that veer between near white to pearly in intensity. The tone of individual white flowers affects the choice of foliage partners. Cool papery white blooms stand out better against lively greens. Warmer ivory tones blend well with soft pewter greys. For grey foliage, the artemisia family is invaluable. Silvery wormwood, A. arborescens, forms clumps to nearly a metre in height. For low-growing mounds, there is A. absinthium, which forms 20in (50cm) high clumps of finely divided greyish-green foliage. The dwarf A. schmidtiana ‘Nana’ barely reaches 4in (10cm) tall, but slowly spreads to form grey, feathery ground cover. “We regularly take cuttings because some varieties struggle through wet winters. Artemisia arborescens has to be replaced every year,” says Troy. With its flowers in many shades of white, grey and green, all playing a role in conjunction with texture and form, this is a garden filled with inspiration. Plants of different heights and spreads all have a role to play in the overall effect of abundance and beauty. Vita Sackville-West’s vision is proof that a riot of colour is not needed to create a captivating scene in any size of garden or border. There’s an art to creating a colour-themed flower border in which many different plants peak at the same time, blending together harmoniously. Success hinges on choosing plant varieties that suit the situation in terms of soil type, aspect and position. Achieving ‘right plant, right place’ ensures healthy plants that bloom plentifully, and are less prone to disease. Soil health is especially important when so many plants are packed into a small area. “The White Garden’s soil had become very poor, so last year we removed every plant, and double dug the beds. We also added loads of organic matter and grit,” says Troy. Roses are fed in early spring and July to keep them in pristine condition. The gardeners at Sissinghurst use a homemade mixture of sulphate of potash with the mineral kieserite, in a 2:1 ratio. Old roses are prone to blackspot and rust, and need spraying fortnightly. “We mix seaweed feed, soapy solution and fungicide, applying with a leaf blower that contains the spray,” he adds. Annuals are useful for filling any holes that appear. Cosmos is invaluable, with the variety ‘Purity’ bearing large open flowers in purest white, above delicate foliage. Taller snapdragons such as antirrhinum ‘Snowflake’, are another staple. it down to ground level, propagating from the cuttings, while the plant flowers for a second time in August,” explains Troy. Flowering shrubs pad out planting but need to be kept in trim and not allowed to outgrow their allotted space. These include philadelphus, hibiscus andvarious hydrangeas. There are delicate and sparsely flowered lacecaps and varieties such as ‘Annabelle’ with very large, spherical heads. Vita planted several cistus, common gum cistus, ‘Blanche’ and rock rose, which, over a long period, produce pristine white flowers that die gracefully. In Saxon times, the land here was owned by the De Saxingherstes, hurst meaning enclosed wood. It was used as a pig farm. Later it became a medieval moated manor farm. This was replaced during the 1500s with a Tudor courtyard house and the Elizabethan tower, which survives today. Gradually, the property fell into disrepair. In the 1700s it housed 3,000 French prisoners of war in appalling conditions during the Seven Years’ War. It was also used as a workhouse and then homes for farm labourers.